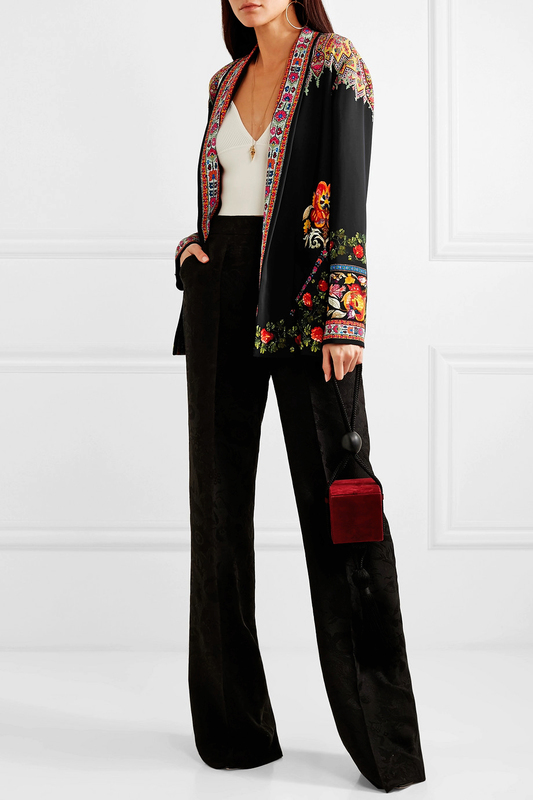 No brand does bohemian glamour and elegance quite like Etro. “My work is an emotional endeavour. I observe everything, storing sensations and inspirations to share with my team,” says Creative Director Veronica - daughter of founder Gimmo. Etro steps into an enchanted garden for Resort '19 - the collection is filled with artful renditions of wild creatures. This snake-shaped ring has been sculpted in Italy from gold-tone metal to wind gracefully around your finger. It's delicately etched with scales and dotted with black crystals on its head. Veronica Etro describes her Resort '19 collection as being a part enchanted fairytale, part '70s psychedelic, and this weightless poncho ticks both boxes. 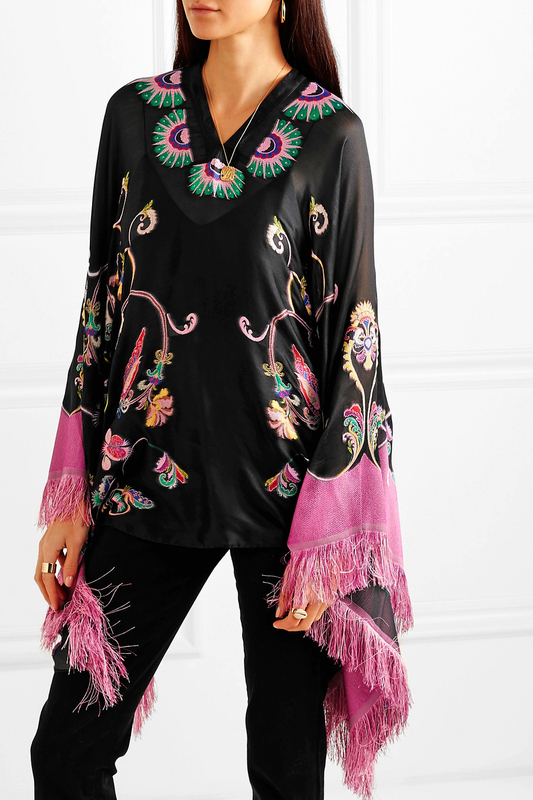 It's cut from fil coupé chiffon woven with almost blurred botanical and paisley patterns and trimmed with wispy fringing. It can be worn for so many occasions depending on what you style it with. 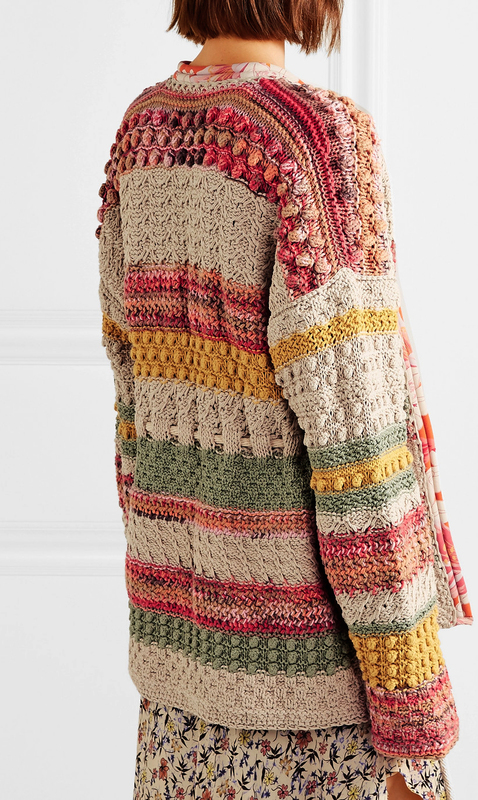 If you're a fan of Etro's intricate patterns, but looking for a pared-back way to wear them, this jacket is such a great option. 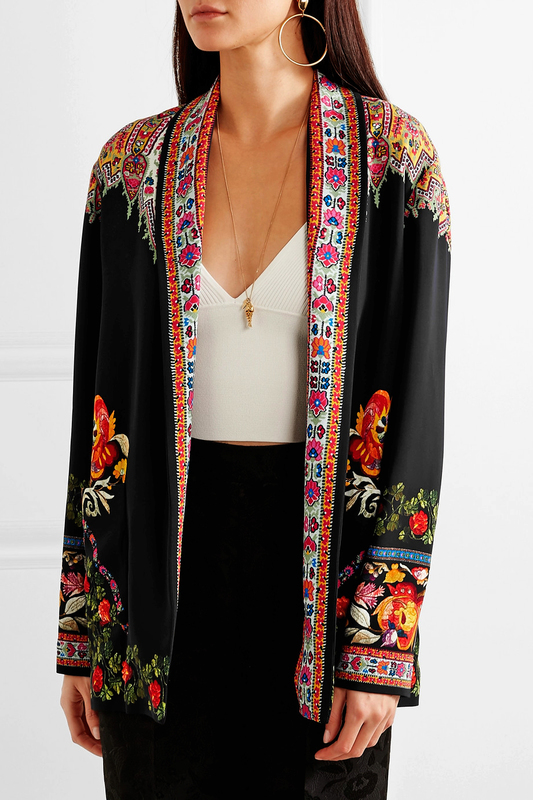 It's been made in Italy from midweight black cady printed with three different vibrant floral motifs. Slip it on over a monochrome outfit and sweep your hair back to reveal the design running along the twill shoulders and front. Etro is one of the brands that had us California dreamin' for Spring '19 - the collection is inspired by '60s surfer flick The Endless Summer. 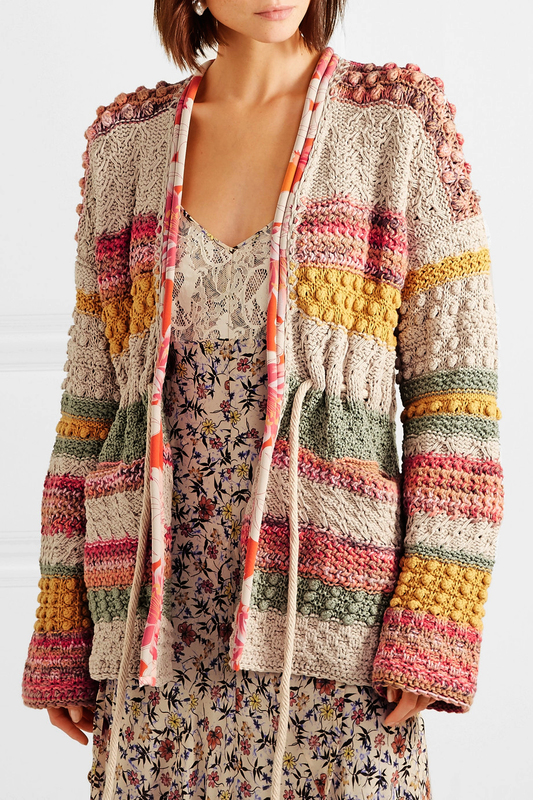 This striped cardigan is thickly knitted and bobble-stitched from airy cotton and linen-blend that's breathable enough to wear during most seasons. Designed for a loose fit, it's trimmed with padded silk-georgette piping down the open front and threaded with a cotton drawstring so you can nip in the waist. Echo the runway styling by layering it over a floral dress. 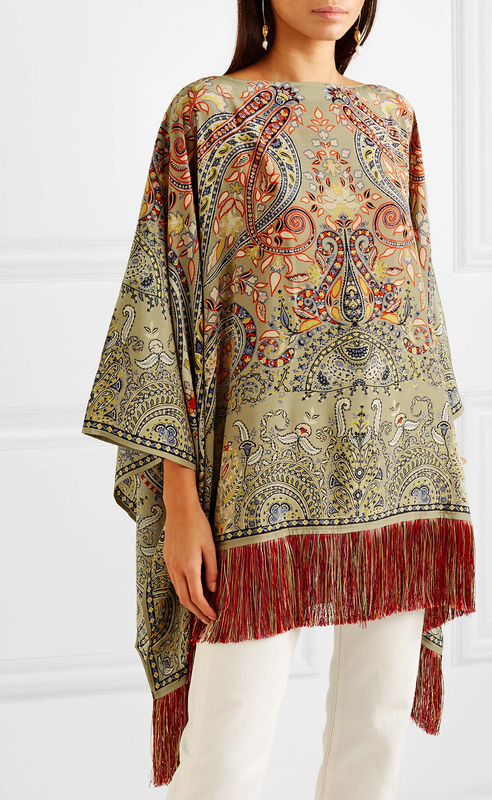 Etro's poncho is decorated with a pretty paisley design - part of the rich tapestry of prints and patterns that have defined the house since day one. Crafted in Italy from fluid satin, it has an elegant boat neck and flows gracefully over your figure before falling to a tactile fringed hem. Slip it on over a T-shirt and jeans or an evening gown.